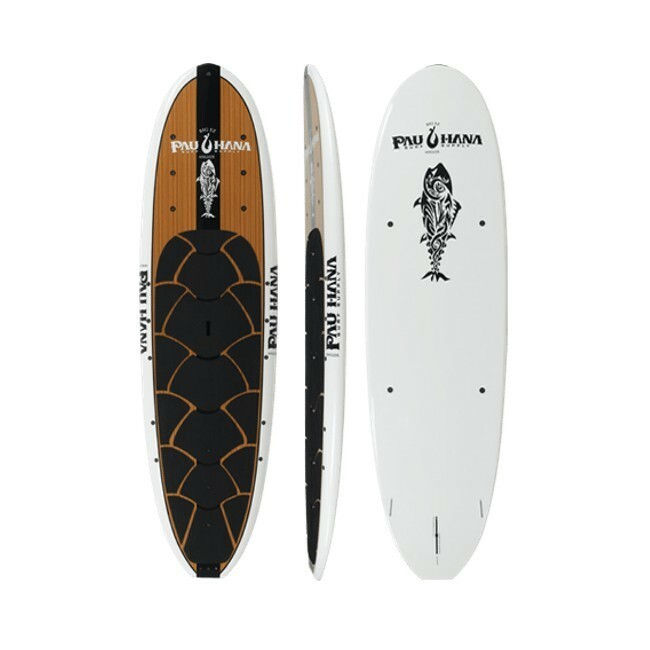 The Big EZ Angler, from Pau Hana Surf Supply, is a fishing specific stand up paddle board that is available in two different models. The 32 inch wide version already offers plenty of space and stability, but if you want even more, there is also a 36 inch version. Both boards are designed in such a way that you can easily maneuver it in shallow water without disrupting any fish, but also stable enough that you can reel in big fish without fear of capsizing. The fact that the Big EZ Angler is available in a 36 inch version is ideal for larger anglers who would like to make the transition from kayak to paddle board, but struggle to find something that can float them properly. The Big EZ Angler is 11'0” in length and 5” thick with a weight of 36 lbs for the 36” version and 32 lbs for the 32” version. The wider board is able to handle a capacity of 260 L and the 32” version can hold 225 L. It is not just a very stable board, but a good looking one as well. For your money, you get real teak in the deck of the board along with an epoxy construction for extra durability. It also has foam padding on the deck to round things off nicely and provide more comfort. Another thing about the Big EZ Angler that makes it stand out is its versatility in terms of mounting equipment. You get 22 Seamount attachments that can be found all over the board, so you are able to place your accessories right where you need them. In addition, the board is big enough to use a chair and cooler if you need them. It has a single 10-inch center fin, which provides great tracking on flat water. Even in rougher water the stability of the board ensures that you can stay in control with ease. If you are serious about angling from a stand up paddle board, then you will love what the Pau Hana Big EZ Angler SUP has to offer.